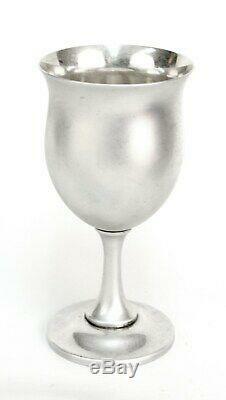 Reed & Barton Sterling Queen Elizabeth Tulip Shaped Water Goblets H120. 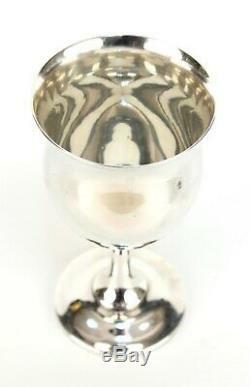 Sterling water goblets by Reed & Barton - H120 Queen. Estate silver in excellent condition - no dings, dents, scratches. Main photo taken with a water base spray to eliminate glare. SUPERB - Used product with its original finish with minimal or no use. EXCELLENT - Used product showing MINIMAL TO AVERAGE USE but with no abuse or alteration. May be refinished to remove obvious detractions and would be so noted - NOT MINT. VERY GOOD - Used product with obvious use - with detractions as noted KNIVES - Unless stated otherwise, we select only those knives that have no dents or deep scratches on the handles and with stainless blades that are not pitted or badly scratched. We have over 30 years of experience as full time dealers with silver being our specialty. We sell to many US and International Dealers on a wholesale basis. Your 100% satisfaction is guaranteed. We didn't create the problem we are just living around it. We appreciate honest and fair offers, if we can't make a deal maybe the other guy can. PLEASE READ OUR TERMS OF SALE. Ask us to deviate from this policy. Excluded countries are: Albania, Latvia, Mexico, Romania and Ukraine. We try to be as exact as possible in our descriptions. To discuss specific information we can be contacted during working hours. Powered by SixBit's eCommerce Solution. The item "Reed & Barton Sterling Queen Elizabeth Tulip Shaped Water Goblets H120" is in sale since Monday, March 18, 2019. This item is in the category "Antiques\Silver\Sterling Silver (. 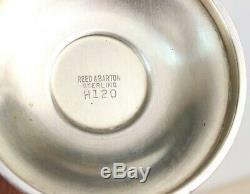 The seller is "stdunstanshop" and is located in Arlington Heights, Illinois.